Spoiled by the gorgeous beaches and vast ocean of Southern Cambodia, I was not expecting much from the mighty Mekong River. I was wrong. 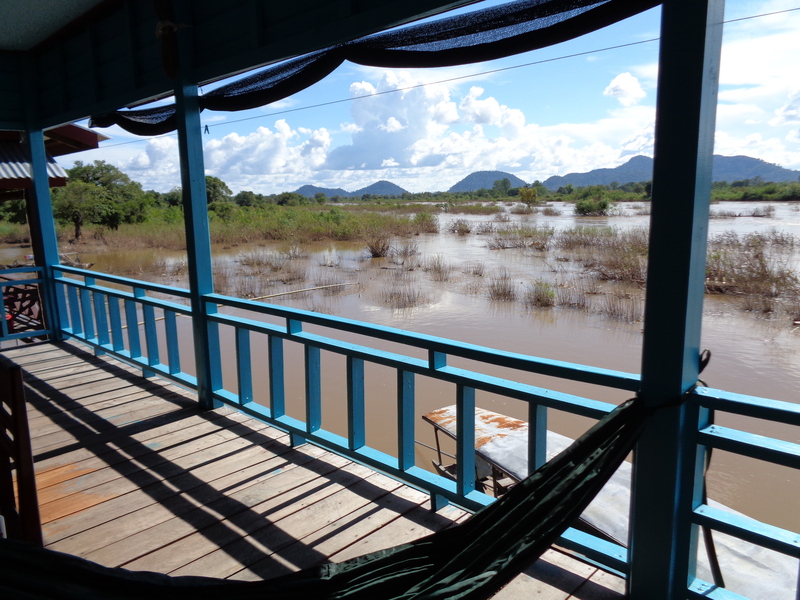 The view from the front porch of my bungalow on the banks of Don Det was well worth the few dollars spent. With a bathroom (most bungalows are not as luxurious), hammocks, and spectacular view of the evening lightning storms; paradise was found once more. Don Det is a part of Four Thousand Islands, an abundance of islands formed by the Mekong River on the border of Cambodia and Laos. Known for its partying amongst backpackers and stunning views amongst tourists, Don Det was shockingly quiet upon arrival. A short bicycle ride away from the main strip allows one to examine village living and the harvesting of rice patties. A ten to twenty thousand kip ($1.25 – $2.50 U.S) bicycle rental is a cheap and prime way to see most of the worthy sights beyond reasonable walking distance not just in Don Det, but throughout all of Laos. When gears are available, I recommend the investment. Check the tire pressure before riding away to ensure an enjoyable trip and expect to get muddy. A bicycle is a great alternative to see the area without paying for bogus tours. 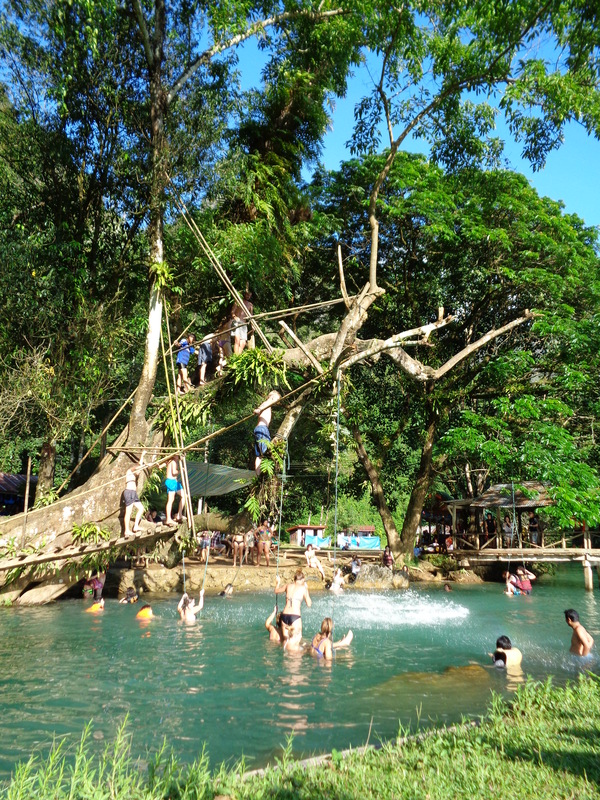 Many towns throughout Laos offer overpriced tours that may be fun, yet rushed and expensive. The Cambodian border crossing bus crew (including Brendan, who was mentioned in my previous post) that I was a part of became the companions that I mingled with during my stay on Don Det. We rented bicycles for a few days and paid the twenty four thousand kip ($3 U.S) toll to cross the bridge onto Don Khon Island. 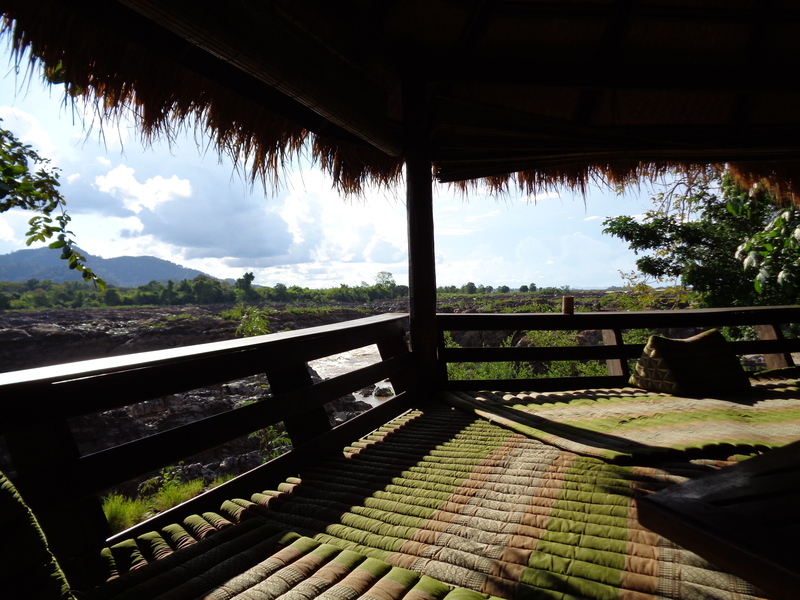 Our destination was the Khone Phapheng Waterfalls, where multiple gazebos full of cushions are provided to lounge around and enjoy the view overlooking the cascades. On our second day return from hours of relaxing, we were caught in a torrential downpour. Killing an hour with a dish of fried rice was not efficient enough to avoid the imposing rain. Our concern was the amount of lightning that filled the ever dimming afternoon skies, but sleeping overnight on our lunch table was not a thrilling answer either. When the lightning finally weakened, we took our chances. The ride back was brutal. Cold, wet pecks pierced my skin as I consistently peddled forward to my eventual dry goal. Being completely soaked to my underwear, I accepted my wet fate quickly. It was the growing darkness and cluelessness of my whereabouts that was most concerning. Within my concentrated fury to press on, I lost my comrades. The rain stopped and a gorgeous sunset erupted across the sky, halting my ride to observe. I fortunately met up with the others just before dark on the main strip. I had entered Laos near the end of the rainy season. It rained every evening while I stayed on Don Det and I witnessed the consequences of such the last morning prior to my departure. 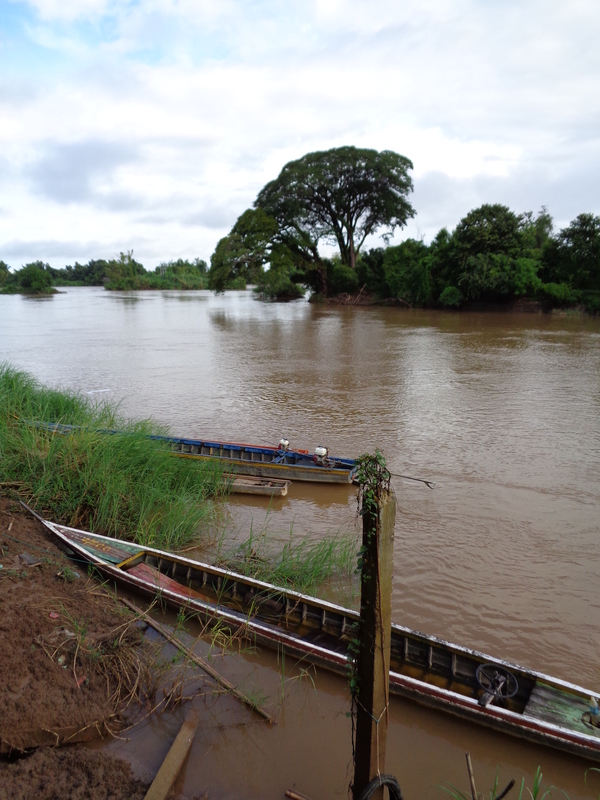 Bungalows and restaurants began to collapse into the river due to the erosion caused by substantial rainfall that season. At least ten different buildings were slanted and ready to plunge. Groups of people were immediately on the scene already disassembling and recovering as much material as they could from the failed structure. I was impressed to see most of the buildings almost completely stripped within two hours. A hellish overnight sleeper bus squeezed between four other men and a pointless day in the boring capital, Vientiane, ultimately steered me toward the towering cliffs of Vang Vieng. Besides Friends playing in every other restaurant (no joke), the forested cliffs dwelling in constant view are what made this little town so special. Visitors enjoy to pub-float, tubing down the Nam Song River to grab a beer at every bar along the way, or to fly high with a hot air balloon ride. Due to excessive accidents and deaths among tourists tubing in recent years, law enforcement has closed many bars and cracked down on intoxication. Another popular option is to bike to the caves, waterfalls, and swimming holes speckled around the area, but be wary. Many families advertise and charge tourists as one of these attractions, resulting in a disappointing fraud. The Blue Lagoon, locally known as Tham Poukham, is the spot to take a swim after venturing the rough, dirt road to get there. A few hours at the lagoon and I had an idea of why so many are taken out of Vang Vieng on a stretcher. Granted, drunken tubing was the result of multiple deaths, but the unsupervised lagoon was a perfect example of idiots at their finest. Dozens of people climbed the tree above to jump into the crowds of people below. The most entertaining was watching a puzzled, semi-frightened man decide how he would go from point A (the tree) to point B (the natural pool). He observed the jumpers prior and chose to try a new approach. He stood strong and victorious on the branch, waiting to deliver a show to his fans and spectators surrounding. A moment later, he simply fell forward, smacking the water hard. Belly flop is an understatement. It was more of a body flop. The entire crowd cringed as we could feel his agony from the painful sound. 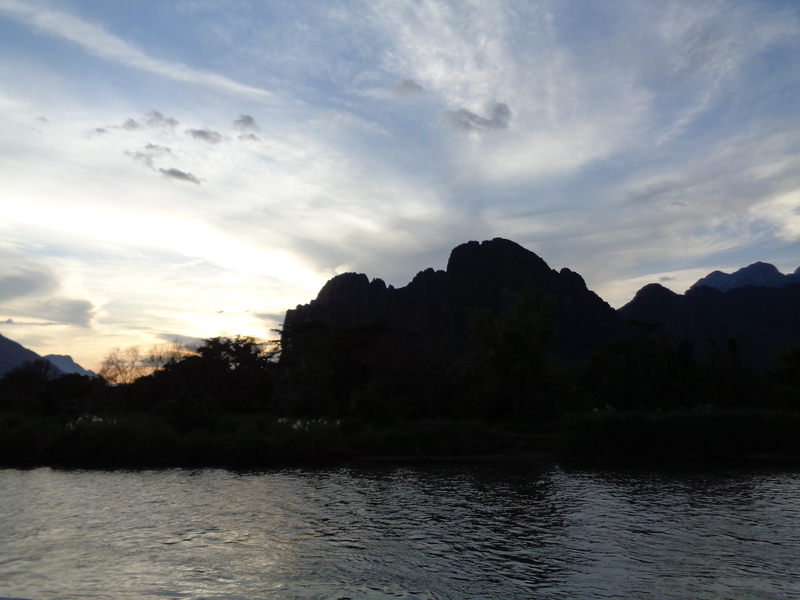 Although beautiful, a few days in Vang Vieng were enough for my tastes. Next stop, Luang Prabang, I hate to call it a city because of its small town feel, especially compared to those that overwhelm Vietnam, but it is certainly one of the more populated areas of Laos. 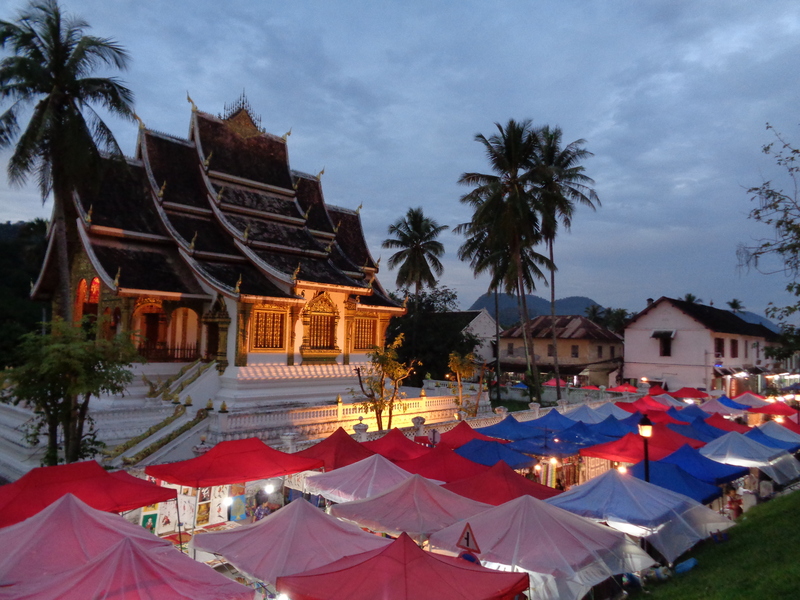 With a remarkable night market and by far my favorite waterfall in Southeast Asia, Luang Prabang is well worth a visit. The bus ride there alone was spectacular as it wrapped around the majestic, high peaks that reached to the heavens. Okay, a bit of an exaggeration, but it sure felt like it at points. 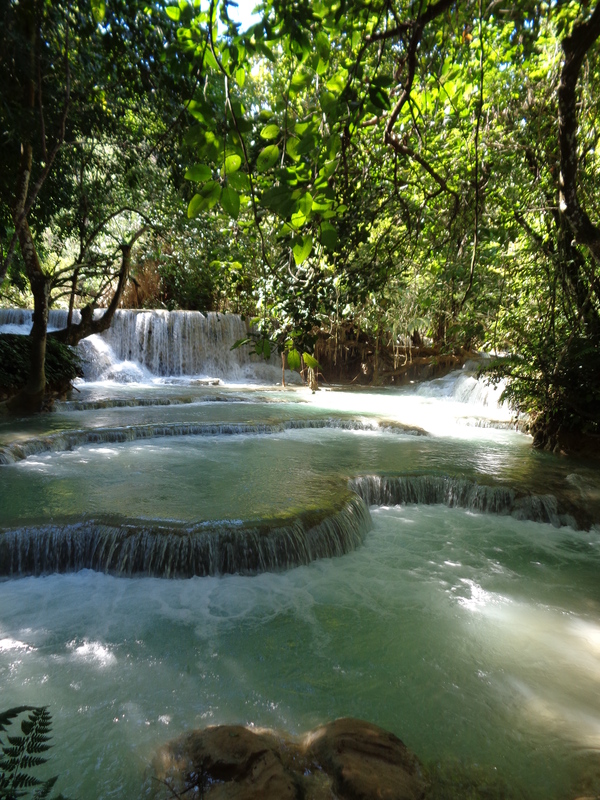 The Kuang Si Waterfalls was another high point of Luang Prabang, literally speaking. The climb to the top was an obstacle to begin with as visitors struggled up the dirt “path” and the descent was even more interesting down the drenched stairwell on the other side. What made the falls so cool was being able to stand on the edge at the top, bracing the poorly made wooden fence to examine the sixty meter drop below. A dip in the cold pools collected at the bottom was rewarding afterwards. A sight to see every morning is the monks collecting alms from the community. Traditionally, people buy a hunk of steamed rice and evenly distribute bits to each monk. Of course, the simplest task I screwed up by purchasing a brick of sticky rice to offer, resulting in me giving the whole brick to one confused, but grateful monk. I only did so because a local woman was shaking her head, saying “No, no,” as I made a mess trying separate the rice accordingly. The experience was a peaceful start to the day nevertheless. I then attended a yoga class, followed by breakfast consisting of an egg sandwich and mixed fruit shake, all before eight o’clock. I learned quickly to stick to the same vendor for a legit hook up. My only downfall visiting the UNESCO World Heritage Site was my first bout of food poisoning In Asia from the ten thousand kip (about $1.25 U.S) vegetarian buffet at the night market. That evening and the bus ride the following morning was awful. Strangely enough, I had no issues the previous evenings and no one else I ate with was sick; however, I concluded the buffet to be the culprit of my illness. As with any meal, especially in Southeast Asia; it is a gamble. Laos was one of my favorite countries to travel on my extended Asian tour and I have not even touched on my Northern village excursions. Everyone I encountered was kind, straightforward, and even with a language barrier, still willing to help as much as possible. The stretch covered in this article was a very far journey across the majority of Laos, but the scenery made every mile worthwhile. Little did I know, the best was still to come.